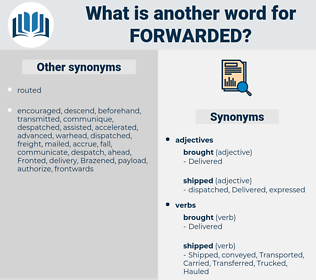 What is another word for Forwarded? 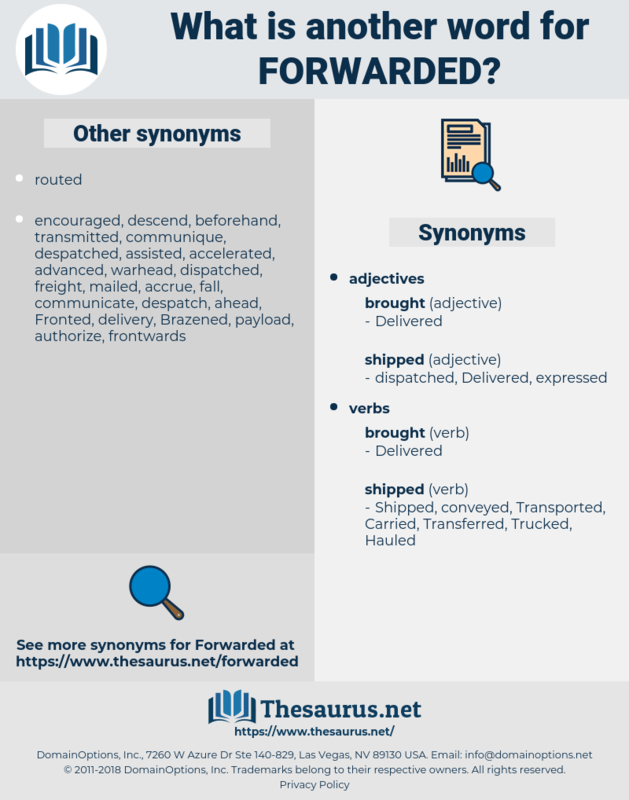 Followed, Awarded, propose, proposed, Proceeded, demonstrated, informed, delivery, Offered, Pushed, Seconded, briefed, moved, Transported, Contributed, Introduced, Delivered, adressed, produced, promulgated, facilitated, Reiterated, removed, relocated, advised, Deployed, Remanded, dropped, handed, circulated, Deposited, remittance, faced, Threw, recovered, Indicated, Challenged, Tendered, distributed, announced, disclosed, Issued, Corresponded, Filed, fed, Petitioned, Deported, tabled, handled, suggested, Responded, checked, drove, received, conferred, Undertook, exchanged, expressed, relayed, Approached, rushed, declared, dismissed, Faxed, Notified, dispersed, referenced, Invoiced, Fielded, dispatched, surrendered, Extracted, pointed, Argued, reserved, Wrote, mailed, Shifted, Imparted, restored, allocated, Wished, fired, payment, laid, Inflicted, Replied, Lodged, Complained, donated, Launched, Achieved, posed, Carried, extended, exposed, recalled, Sailed, Brought, turned, texted, Questioned, Performed, furnished, liaised, Echoed, Shipped, Obtained, Contended, Channeled, Channelled, Ceded, conducted, committed, Took, Leaked, dispensed, Abated, placed, Reached, Arrived, posted, Rendered, Passed, Did, Supplied, signalled, contested, release, released, Streamed, voiced, Appealed, Remitted, sacked, raised, stated, subject, suspended, Served, tested, Told, Gave, applied, wanted, required, left, Went, Talked, spoke, Returned, called, made, Got, transmit, Communicated, transmitted. Progressed, Afforded, Followed, Drafted, Worded, Awarded, communications, drawn, discarded, formulated, transfered, transposed, resubmitted, proposed, acknowledged, informed, redeployed, Offered, reintroduced, broadcasting, broadcasted, downloaded, coordinated, rehabilitated, Pushed, processed, Disseminated, Receded, Seconded, Promoted, supported, redirected, moved, clarified, Transported, Forgiven, Sped, incorporated, interfaced, aired, recommended, re-established, Contributed, Extradited, Introduced, Administered, Delivered, produced, framed, described, outlined, retransmitted, reviewed, promulgated, facilitated, contracted, removed, ordered, focused, focussed, Adduced, considered, expedited, relocated, identified, advised, Generated, Trafficked, withheld, Deployed, Remanded, abandoned, commissioned, Prosecuted, advertised, dropped, handed, documented, Targeted, Tackled, articulated, circulated, thrown, discontinued, renewed, spread, Apprised, Deposited, despatched, uploaded, geared, charged, couriered, Originated, accomplished, Been, confiscated, recovered, Indicated, Challenged, rescheduled, Tendered, distributed, flooded, minister, changes, announced, disclosed, expected, Issued, refers, Filed, Undergone, Aimed, Audited, reoriented, fed, repaired, Deported, Excluded, tabled, Devolved, centred, lifted, statement, Switched, Showered, handled, suggested, driven, repatriated, conditioned, ducted, outsourced, communication, Responded, Undertaken, featured, Negotiated, Mentioned, elaborated, checked, Ejected, received, Examined, Borrowed, Inserted, Translated, conferred, terminated, exchanged, expressed, bid, recaptured, reference, landed, relayed, worn, accompanied, traced, Approached, designated, acquired, dismissed, dispatch, portrayed, pursued, admitted, sponsored, Notified, referenced, supervised, Tasked, completed, headed, Shown, Escorted, refunded, reopened, Fielded, Displayed, dispatched, surrendered, Disbursed, written, come, stuck, communicate, nominated, revived, restricted, Extracted, pointed, enqueued, led, routed, Stationed, Delegated, guided, paid, mailed, Appended, Flown, rejected, refurbished, disciplined, Shifted, Incurred, billed, gathered, Imparted, Influenced, resettled, restored, allocated, ventilated, undermined, Migrated, regulated, fired, laid, Discussed, derived, inherited, escalated, Inflicted, cascaded, Knocked, relieved, Arisen, Replied, Fought, Lodged, Emailed, oriented, Divulged, Viewed, Instituted, donated, realized, Annexed, Launched, Achieved, Died, credited, posed, disposed, destined, Carried, Exported, extended, seised, assigned, Devised, Repaid, selected, sourced, exposed, Taxed, Indicted, Brought, turned, diverted, populated, Leveled, Levelled, Questioned, grasped, Consulted, Screened, used, associated, Performed, devoted, Dealt, marked, furnished, scope, mandated, studied, Quoted, organized, listed, treated, governed, Shipped, Invoked, granted, dedicated, designed, Beamed, Exempted, Postmarked, Obtained, seized, matched, taken, assumed, revealed, enclosed, attached, Channeled, Channelled, bound, conducted, entrusted, committed, intended, Leaked, dispensed, televised, placed, Reached, collected, staffed, Arrived, done, effected, Sentenced, posted, Rendered, reprinted, Summoned, included, Passed, Earmarked, sub-mitted, attained, kept, healed, Supplied, signalled, concluded, contested, released, discharged, voiced, Captured, Appealed, Inspected, traveled, travelled, Supplemented, Managed, Remitted, Borne, raised, acquainted, joined, Subjected, accessed, tied, Cared, controlled, equipped, Complied, given, suspended, Served, tested, Consigned, sought, Told, attended, connects, dated, cast, heard, applied, covered, vested, taught, required, requested, left, Cited, vented, Expelled, Piped, linked, Yielded, gone, spoken, Counted, Talked, Emitted, Surveyed, unleashed, Returned, attempted, contained, reunited, Entered, run, struck, called, Met, made, Gotten, shed, transmit, Communicated, transmitted. If Mr. Joyce calls he can get his property, otherwise it will be forwarded to the main baggage office in New York." Suddenly, in came a messenger with a letter which had been forwarded from Paris. fiord, ferret, fretted, far-out, forehead, fair-haired, fortieth, fortitude, favorite, forrard, freed, fireweed, forte, fruit, furrowed, freehearted, fried, frat, feverroot, freud, fret, faraday, frothy, furred, froward, forty-two, firth, ford, fort, forrad, favourite, frayed, friday, free-reed, favored, firewood, foredate, ferrite, fart, forth, fraud, froth, frittata, fruitwood, Fibroid, forty, fevered, fur hat, fruity, forthwith, fortuity, fired, farad, foreword, ferret out, fourth.